Please note: There are no active links in this How-To-Guide, just pictures and text. You cannot login from this page. Please refer to the access link provided in your confirmation email. The Webcast page is also the Replay Page where you can download the MP3. Please see below under the "Webcast" section for further details. Q&A comment box for asking questions, or by phone or web call press *2 to raise your hand. Asking Questions to Mas: Press *2 to raise your hand if you are connected by phone or web call. If you are connected by webcast, there is a Q&A comment box for submitting questions. The webcast link is also the replay page once the live call has ended. On the Replay Page you are able to download the recording as an MP3. Click on the Download link to import the MP3 to your computer. 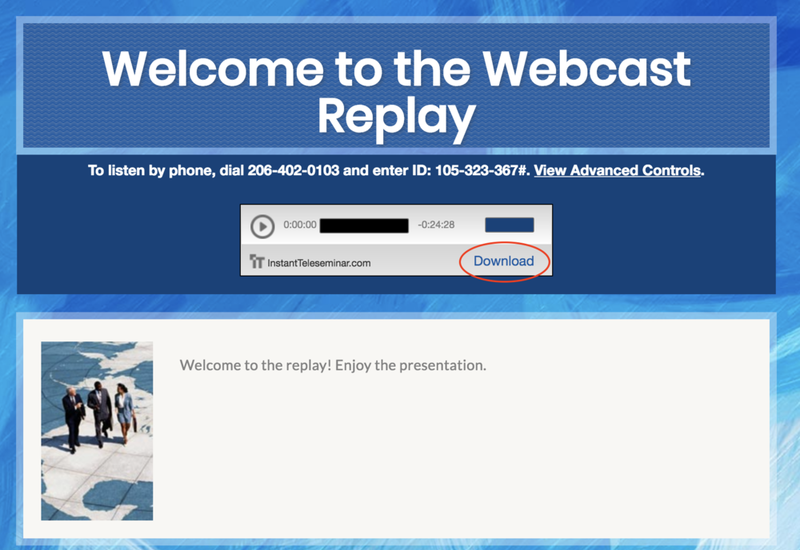 If no replay is available, you can access the call replay through the Back Up Recording. You will need to scroll forward 15 min to reach the start of the recording. The Question & Answers with Mas portion of the call is located in the replay as a separate track or in the back up recording.